Upward Bound Math and Science Award Certificate - This is a certificate that I made using a website called certificate street. It has lots of award templates that were made by educators to be shared with educators. These templates are also free if you don't mind a small watermark in the bottom corner. Upward Bound Math and Science Infographic - This link will take you to an infographic giving information about what UBMS is and what the program does. (I have also included the flyer below for quicker access.) This is what we would print out and hang in our local high schools to help spread the word that we are ready to take new applications. We would attach this to our Facebook page as well! Upward Bound Newsletter for Upcoming Events - Here is a link to a sample newsletter that we would send out to our UBMS participants, parents, and staff. 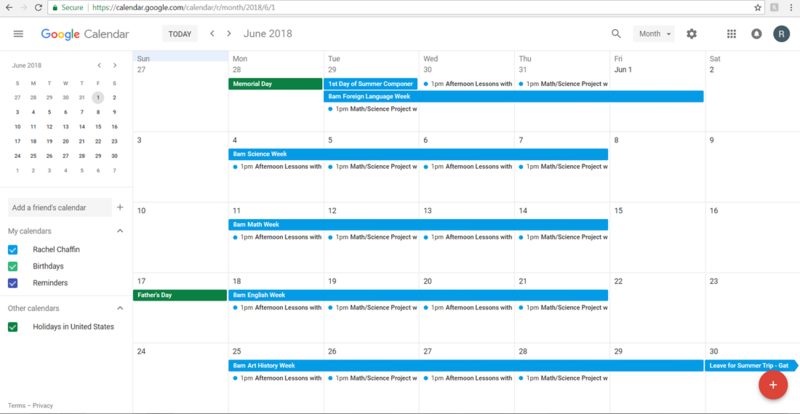 Google Calendar for Summer Program Planning - Here is an image of the Google calendar I have started. This resource would be a great collaboration tool between the UBMS staff to plan our summer program. I can add other staff members to be apart of this calendar and we can all stay up to date on the planning of the summer. Then after we are finished making changes, we can print it off and give to our students. This way our students will know what we are doing from day to day. Certificate Street - This is a resource that you can make free certificates. MailChimp- Here is a free resource that can be used to make newsletters, flyers, or announcements. Using MailChimp makes it easier to have a digital newsletter. You have the capabilities to send it to a list of students or colleagues. You can also set up a subscribe to mail list. Smore - Smore is another resource to make newsletters and flyers.